I know that I am woefully behind on getting some pretty stuff to look at up here and I'm working on it, I really am!!! For now, you must go to Debbie Doncaster's Blog and check the yummy stuff she is giving away for her Blogoversary! I knew when I saw the sketch this Monday that I wanted to use this image that I got from the Wish List over at SplitCoast. And once again, I sure hope Julee doesn't mind that I flipped the sketch - LOL! Your sketches are just so usable and flip-able! I can't help myself! The paper is from the pack of Making Memories that I got while I was away with DH in Austin and from a piece of KI Memories Holiday Collection that I've had for...well...a while! Buttons and ribbon? Same thing...had 'em for a while! In playing in the Canadian Image Express Swap, I get all kinds of images that I would not normally purchase but have come to love. I'd never heard of Sugar Nellies until I started playing on that thread and I've come to love them. When they come up on someone's list, I snag 'em! Guess I should start buying my own - LOL! I coloured her with my Copic markers based on some of the Making Memories papers that I bought while out shopping in Austin one day. Funny thing is, I originally had her hair blonde, but decided that she looked better as a brunette. Gotta love Copics for that! I just coloured right over the blonde - no problem! Looking at her now, I'm pretty sure I did her for a sketch challenge somewhere, but can't remember where now...that figures - LOL! I used my SU! Word Window punch for the handwritten "Just a Note" sentiment. Aren't they both just the sweetest??? I think it's my turn now to choose some people to nominate! 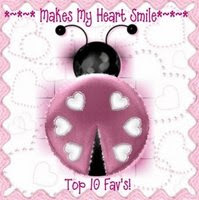 Go visit these blogs, because whenever I visit them, they always make my heart smile...no matter how bad my day has been! 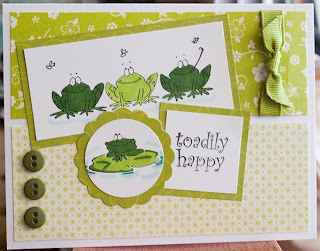 On March 28th, I participated in the Mini VSN challenges over at SplitCoast Stampers. For VSN in May, we're going to Vegas baby!!! So all the challenges last week used inspiration from various hotels in Las Vegas. If you've ever been, you know that the Venitian is plush with lots of rich, regal colours. Our challenge for the Venitan Hour (12 noon) was to use burgundy, navy blue, gold and white/cream. 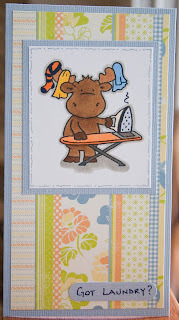 As I was pulling the colours I thought that they leaned toward a masculine card. 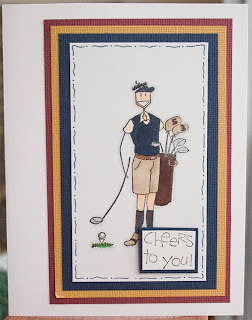 Since my BIL has a birthday today, I decided to make a card for him using Golfafella which was so GENEROUSLY stamped for me by Annabelle who plays with me over on the Canadian Express Image Swap thread at SCS. My BIL is an AVID golfer, so I knew the image would be perfect! I coloured our fella in with a combination of SU! Markers and Copics and then matted him with the three Venetian colours before adhering my stack to an A2 card face. The "Cheers to You" was also received from the Canadian Express Image Swap thread. Since I started playing on the Canadian Express Image Swap list (and even before that), I just love Riley! 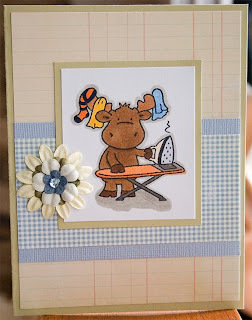 He is the cutest little moose ever!!! I received Laundry Riley and had fun colouring him while I was lounging by the pool in 75F+ weather in Austin last week! While I was in Austin, I picked up a 6 X 6 pad of Chloe's Closet by Making Memories and took the colours from that paper to colour Riley. 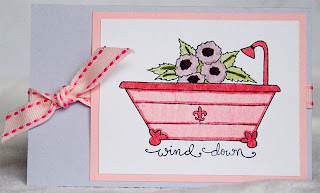 This card is 3 1/4" X 6" and was made from a piece left over from another project. 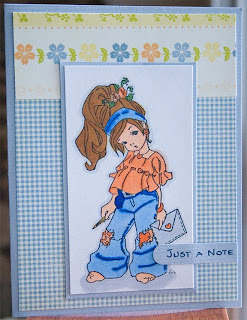 This card is a standard A2 card and I used some of the Chloe's Closet gems that I got to match the Chloe's Closet papers. 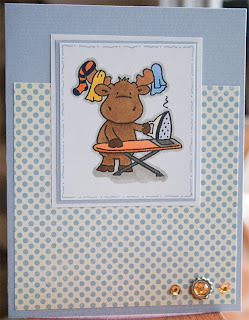 This card is also standard A2 size and features stacked Primas with a gem from the Chloe's Closet pack. 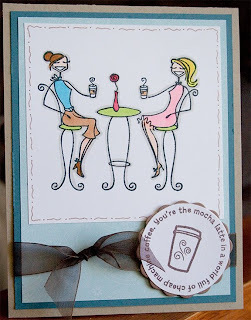 Time for a litte Java with my Bellas! I'm meeting some good friends for coffee this morning and I can't wait! Most of them will have already left so it's safe to post the little surprise I made for each of them. In fact, some of you early risers will probably even see it before they do! I've been doing some image swapping online (as I may have mentioned - LOL!) and I received this image last week from one of the swap lists I'm on. I know, it's AWFUL that I can't remember these things, but old age is creeping in you know...I'll be forty (ACK!) in a little over two months. Anyway, if you want to check out the swap lists I'm on, it was either this one (Canadian) or this one (International). Whichever one you choose (if you decide to play along), be warned that it is VERY addicting! I estimate that I already have close to 4" inches of images that I have already received and that is only about 1/2 of what is coming to me. Yes, I will be doing LOTS of colouring!!! I coloured in the girls using my (beloved) Copic Markers (that's a whole other addiction for a whole other post!) and trimmed the image down to 3 1/2 X 3 1/2 (more or less). Under the Bellas is a layer of 3 3/4" X 5" Soft Sky DSP (yes, this is still my most favourite SU! colour EVER!!! ), followed by a layer of 4" X 5 1/4" Blue Bayou and mounted onto a Kraft card base. The little coffee cup is from a Gel-a-tins stamp set that I have had for AGES and has rarely seen ink (that'll change now that I have Javabellas and Lattebella to play with) as is the saying that reads "You're the mocha latte in a world full of cheap machine coffee". I matted the image/sentiment of a piece of Close to Cocoa which was cut with my Quickutz nesting scalloped circles. The finishing touch is a chocolate brown organza chiffon ribbon. DH and I were away most of the week, so I only really had yesterday and today to create - it's good to be back!!! 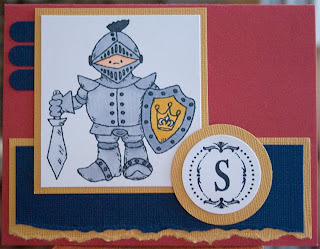 I made this for DH, who is (and always has been) my knight in shining armor. He's always there when I need him...especially at the end of an insanely busy day! When he comes home and wraps his arms around me, it's almost like the whole world disappears! I just got my first ever High Hopes order in today and I can tell you one thing for sure: I will DEFINITELY be ordering from them again...especially since they are a Canadian company - WOOT! I coloured my knight using my Copics and used a Just Right monogram as an accent. This post originally appeared on March 29th...unfortunately, I forgot to add the pic so here it is in it's entirety. ...There's a good chance that DH and I are rushing around the house like crazy people right now getting ready to head down to Austin, so thank goodness for the AutoPost feature on Blogger! I coloured the image using my SU! Markers and matted on a piece of pink cardstock from Michael's. The card base is a quarter sheet of 8 1/2" X 11" cardstock folded in half, so it's REALLY small with a finished size of 2 3/4" X 4 1/4".